89 MEMBERS. 1,514 HOURS EXCHANGED. While we prefer to meet and talk with our HVHE neighbors face-to-face, we don't always have the time to do that. Social media affords us the opportunity to connect until such time as a pot luck or other event brings us all together again. There are some interesting links and discussion topics on our Facebook page. Have a look and join the conversation. Ask your Facebook friends to LIKE our page and have their say too. When we meet again we can continue these discussions in person. Until then, share a skill with a neighbor. Or request that a fellow exchanger fill one of your needs. Let's build community and become active memebers of the solidarity economy one hour at a time. Happy exchanges! The recent Newburgh member pot luck on Sunday March 16 was a resounding success. There was a dizzying assortment of delicious foods and refreshments. The atmosphere was convivial with members getting to know each other better and learning more about HVHE and time exchanging in general. One dozen adults and four children attnded the gathering at Calvary Presbyterian Church Community Center. We recently welcomed seven new Warwick area members on March 25. We eagerly look forward to meeting and exchanging hours with our new members! Don't forget to tell your friends and also 'LIKE' our new Facebook page! Download a full list of services members can offer or request. What kind of people join an hour exchange? Anyone! Parents, seniors, college students, artists, business owners. People who have a skill to share. People who want to learn a new skill. People who have unmet needs. People who want the best for their community. There is a suggested donation of $25 a year. Your donation helps offset the costs of things like printing brochures and maintaining the website. Members who wish to contribute hours in lieu of money may contact their coordinator to discuss. Can a business or organization join? Yes! 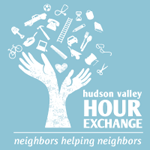 The Hour Exchange can help your organization to meet its volunteer needs, reward volunteers who are performing valuable work, broaden the variety of skills and resources you can bring in, strengthen your connection with your surrounding community, save money and more. We are all assets. Every human being has something to contribute. kind of work needs to be honored, recorded and rewarded. We need each other. People helping each other reweave communities of support, strength and trust. Community is built upon sinking roots, building trust, creating networks that are built on mutual respect and commitment. Respect demands accountability. The voices of all must be heard and heeded so as to promote social justices and compel accountability. Become a sponsor and your business card will go here! hOurworld: 44,342 MEMBERS. 2,310,453 HOURS EXCHANGED.